INDIANAPOLIS -- Indiana has extended for another year the public health emergency declaration in the rural county at the center of an HIV outbreak that spurred a state law allowing needle-exchange programs. State Health Commissioner Dr. Jerome Adams extended the declaration in Scott County through May 24, 2017. That will allow the county about 30 miles north of Louisville, Kentucky, to continue to operate its needle-exchange program to curb the spread of diseases among intravenous drug users. Nearly 200 people have tested positive for HIV in Scott County since an outbreak linked to sharing of needles used by drug users was identified early last year. Adams says the risk factors that led to the HIV outbreak still exist in Scott County. 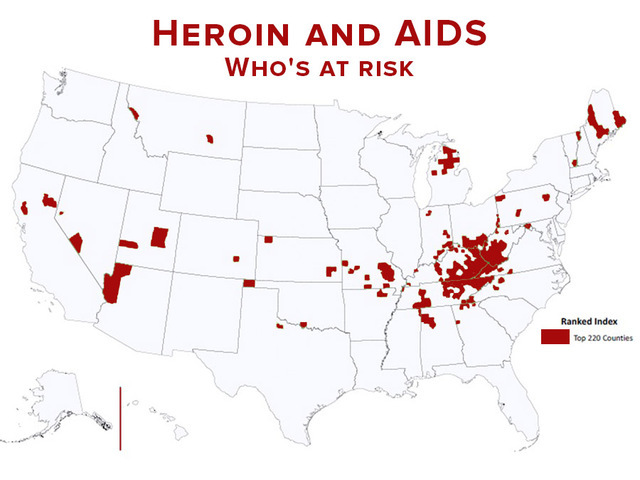 After Scott County's outbreak, the U.S. Centers for Disease Control and Prevention mapped 220 counties most at risk due to sharing needles, an unhealthy but fairly common practice among heroin addicts. The agency found that the nation's concentration of at-risk counties is in the Tri-State: Southern Ohio, southeastern Indiana and eastern Kentucky. A portion of Northern Kentucky is singled out, too. Much of West Virginia is considered vulnerable.